Residents look at a drawing of the project at the open house meeting. A major change is coming to the intersection of Eastwood and Military Cutoff roads, and dozens of the area’s residents and business owners had lots of questions for North Carolina Department of Transportation officials at the open house meeting they hosted Monday evening at College Acres Baptist Church. The latest proposal for the Eastwood Road overpass, which will eliminate all left turns at the busy intersection, now includes the construction of new extension road, Drysdale Drive, on the northwest corner of the intersection behind the Eastport residential neighborhood. 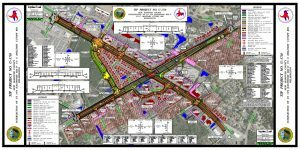 In addition to providing a cut through for drivers trying to get from one of the major roads to the other, it could also serve as the entrance to the proposed CenterPoint mixed-used development, which recently passed the Wilmington’s planning board and will soon be presented to city council. Though the Drysdale road extension, which will have at least two lanes on each side as well as a signal, would bring more vehicular traffic and noise behind their neighborhood, it isn’t the biggest concern of Eastport residents. Due to the elevated grade of the overpass, NCDOT will have to build a retaining wall where the Eastport neighborhood’s current opening to Eastwood is. In addition to being a way for cars to get in and out, residents also use the sidewalks there to walk to and from Mayfaire and other nearby places. 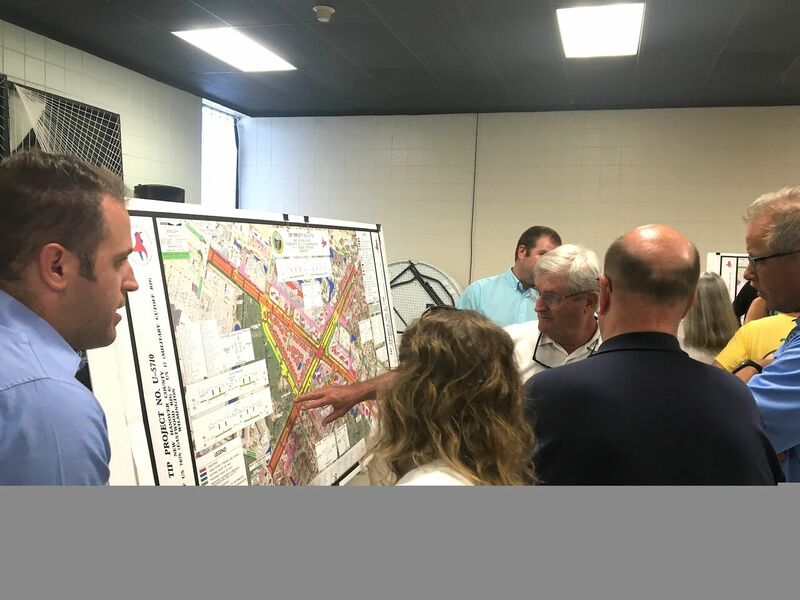 Price and Eller, who also pointed out that emergency vehicles would also have a harder time getting into the neighborhood if there was only one way in, voiced their concerns to Mike Bass, the NCDOT’s project manager. Wilmington City Council member Kevin O’Grady, who was at Monday’s open house, said he’s also concerned about Eastport only having one access point. He’s also skeptical about how the overpass design, which, due to the elimination of all left turns, would force people to drive at least a block to the next traffic light to make a U-turn, would help alleviate congestion. O’Grady and Paul Lawler, who was also present Monday night, were the only two council members to vote against The Avenue, a large mixed-use development that was approved by city council earlier this month. O’Grady had questions about the traffic for that project (an overpass is also being proposed for the intersection of Military Cutoff and Market Street, which is close to The Avenue’s site) and said he’ll have similar questions when the CenterPoint development is up for a vote. If the current proposed plan is followed, the new Drysdale Road will be built first and be put in regardless of whether or not the CenterPoint development is approved, according to Bass of the NCDOT. The current project schedule, which is subject to change, has right of way purchases beginning next year and construction beginning in 2021. The project’s budget is $22.5 million and is already funded through state and local measures. Comments to the NCDOT regarding the proposal can be emailed to Bass at mlbass@ncdot.gov or written and mailed to: Michael Bass, Project Manager, 5501 Barbados Boulevard, Castle Hayne, NC 28429. Comments must be submitted by July 16, 2018. More information on the project can be found by visiting www.ncdot.gov/projects/publicmeetings and searching for TIP Project U-5710.